The narrow nationalist framework is shared by a good number of leaders of the Member States, but they have the good taste to express it elsewhere than at the U.N. General Assembly. The idea is not radically new. Charles Maurras (1886-1952) the French nationalist ideologue who published some 10,000 articles, most in L’Action Francaise, had as his motto “La France Seule” (France Alone). The Association of World Citizens defends the fundamental principles of international order – what we call World Citizen Values: equality, respect, cooperation and living in harmony with Nature. It is on these values that we can build a harmonious world society. Today, the world society faces four interrelated challenges: climate change, migration, persistent poverty and armed conflicts. Thus, we must look at the ways that governments deal with these four issues. There are efforts made at the national and the U.N. level to deal with all four issues, but often with separate programs in separate forums or structures. The same holds true for nongovernmental organizations that are in consultative status with the U.N. However, it is easier for NGO leadership to have a holistic approach. NGOs working with migration and refugees are acutely aware of the consequences of armed conflict from which people flee and of poverty from which people migrate in the hope of finding a better life elsewhere. The U.N. has provided mediators for some current armed conflicts such as Yemen, Syria, and Libya, and UN buildings such as the Palais des Nations in Geneva, have been used for some of the talks. Yet the conflicts continue. One cannot say that mediation has “failed” as the mediator serves primarily as a “go-between” among factions, rarely offering “solutions” of his own. Thus, mediation continues; it is the armed factions that have “failed”. In other cases, such as South Sudan, Democratic Republic of Congo, and the Central African Republic, U.N. mediation efforts are linked to the deployment of U.N.-mandated armed forces. Again, each of these armed conflicts continues. The presence or not of U.N. peacekeeping troops is not a deciding factor for negotiations among the armed factions. If “globalism” means action through the U.N. or other regional multi-governmental bodies such as the Organization for Security and Cooperation in Europe (OSCE), then “globalism” in itself does not “solve” many armed conflicts or regional tensions. However, we can also ask if “patriotism” – meaning a narrow national-interest framework for decision making is really a viable alternative. When Hans J. Morgenthau wrote his widely read book, In Defense of National Interest (1951), he was concerned with the “globalist” ideologies and practices of the Soviet Union and the U.S.A. Both leaders of power blocs involved themselves in armed conflicts where they had no vital interest but were concerned that an ideological opponent might come to power. Thus Morgenthau’s opposition to the U.S. war in Vietnam. The same reasoning would hold for the USSR intervention in Afghanistan. “National interest” can be a restraining framework – “Do I really want to get involved there?” However, national interest can also be used to defend an expansionist policy: “U.S. access to Middle East oil is in U.S. nationalist interest.” National interest is most often used as a consideration for military action rather than for efforts at mediation. 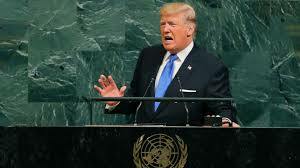 President Trump has set out the lines for debate at the level of the United Nations as the Presidents of Poland and Hungary have done for the European Union. We have to thank them for bringing the debate to the fore. The position of the Association of World Citizens is clear. We believe that we need to explore the ways to live as one global family protecting the Planet with a sense of responsibility for both present and future generations. We do not have the same access to the media as President Trump or the Presidents of Hungary and Poland, but a crucial debate is on the way concerning the ways the world society is to be organized. We need to be an active part of this great debate on which much of the future rests. *René Wadlow is a member of the Fellowship of Reconciliation’s Task Force on the Middle East, president and U.N. representative (Geneva) of the Association of World Citizens, and editor of Transnational Perspectives. He is a member of the TRANSCEND Network for Peace Development Environment.